Learn about the basics behind simple interest. See the steps to derive the simple interest formula. (1st math video). See the steps to derive the maturity value formula. (2nd math video). t is the loan duration in years. Where the definition for P, r and t are the same as above. The math videos below will explain the basics and the steps to derive these two formulas. You can see the examples on using these formulas here. In this lesson, we will learn about simple interest formula. Let's say that we have a loan of $5000, with an interest rate of 10% per year, and the loan duration is 3 years. Calculate the loan's simple interest. Now, the 'interest' is the amount of extra money we need to pay, for using the loan. Therefore, it is very important to learn how to calculate the interest of a loan. Here’s how. Since we are calculating simple interest, the amount of extra money we pay is the same every year. To show this, let's represent the principal, $5000, with this green bar. Now, after the 1st year, the interest is 10% of the principal, which is equals to $500. Here, how do we get this $500? To calculate it, we simply multiply $5000, with the interest 10%. 10% is the same as, 10 over 100. By multiplying $5000 with 10 over 100, we will get $500. So, that is how we can calculate for the interest, $500. Next, after the second year, the interest is again 10% of the principal, which is another $500. Here, we can see that, the total interest for the first year and second year is $1000. Similarly, after the 3rd year, the interest is again 10% of the principal, which is another $500. Since this is a 3 year loan, the total interest that we need to pay is, $500 + $500 + $500, which is $1500. In other words, this is the total amount of extra money that we need to pay for using the loan. After understanding how simple interest works, let's derive the simple interest formula. First, let's change the principal to P, and the interest rate per year to r.
By doing so, we can see that this $5000 becomes P, and this 10% becomes r.
Now, P multiply with r, gives Pr. From here, we can see that this $500 can be represented with Pr. Therefore, we can represent each of these $500 as 'Pr'. Now, adding these terms together gives, 3Pr. Hence, we have, the interest I, equals to 3Pr. Let's rewrite it here. Notice that, the number 3 here, is actually the loan duration. So, when we change the loan duration to T years, we get, I = tPr. Next, we can shift this t back. By doing so, we get, I = Prt. With this, we have the simple interest formula, I = Prt. That is all for this lesson. Try out the practice question to further your understanding. 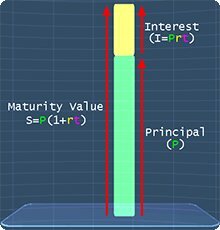 After understanding the basics behind simple interest, we can now learn about the maturity value formula. Consider a loan with the principal 'P', with interest rate per year of 'r'%, and the loan duration is 't' years. Derive the maturity value formula. Now, the maturity value is the total amount of money that we need to pay back, after the loan duration. To explain this, let's represent this green bar as the loan's Principal. And, represent the yellow bar as the loan's interest. Now, we can find the total amount of money to pay back, by adding the 'principal' together with the 'interest'. Knowing this, we can write the equation, maturity value, equals to principle, plus interest. Next, let’s represent the maturity value as S, principle as ‘P’ and interest as ‘I’. Now, from the previous lesson, we learn that the simple interest, I=Prt. Therefore, we can change this, I to Prt. Notice that, these 2 terms, have 'P' as a common factor. Hence, we can factorize these terms, by taking out ‘P’ in each term. By doing so, we get, P(1+rt). Finally, we have the formula for maturity value, S=P(1+rt). You can start by going through the series of questions on simple interest choice of question below.